As a practicing (albeit non-professional) taxonomist, I spend a goodly amount of time examining specimens collected not only by me, but by others as well. I’ve mentioned before the benefits of doing this—both to the collector, who gets names for the specimens in their collection, and to my own research in being able to cast a broader net in my search for new distributions and host associations within my two primary focus groups—Buprestidae and Cerambycidae. Such information remains surprisingly incomplete for these two popularly collected groups of beetles, and every few years I assemble whatever records that I’ve accumulated to that point for publication in the form of a “notes” paper (e.g., Nelson and MacRae 1990, Nelson et al. 1996, MacRae and Nelson 2003, MacRae 2006, MacRae and Rice 2007). Occasionally I encounter species that I have not yet collected myself (although with ~70% of Nearctic species now represented in my collection, this is becoming more and more infrequent), and in most such cases the collector graciously allows me to keep an example or two (leading to the saying, “Sometimes the best collecting is in other people’s collections!” ☺). The ultimate find, however, is a specimen or series of specimens that represent an undescribed species. Yes, even amongst North America Buprestidae and Cerambycidae there are many species still awaiting discovery (imagine the situation with other families of beetles, many receiving far less attention than these two popular groups). The beetle shown here, a member of the genus Anambodera, represents one such species. This individual is part of a small series collected in Nothing, Arizona this past summer by Paul Kaufman, an indefatigable amateur beetle collector who has routinely over the years provided fodder for my research in the way of new state records and, more recently, new larval host records through rearing. While the key characters that separate Anambodera from the closely related and exorbitantly speciose genus Acmaeodera (front margin of epistoma not reflexed or plate-like, front angles of pronotum rounded in side view, suture between 1st and 2nd abdominal sterna visible, etc.—see Barr 1972), the coarse elytral punctation and heavily sculptured and bronzed pronotal surface are classic gestalt for Anambodera and unlike any of the small, vittate species of Acmaeodera that they resemble. This specimen keys to A. gemina, but it clearly differs from that species in a number of characters. Anambodera is restricted to western North America, and species tend to be poorly represented in collections due to their more cryptic habits (unlike Acmaeodera, most tend not to visit flowers, but are instead found alighting on rock surfaces or bare soil). As a result, the genus is still incompletely known and in bad need of revision. Dennis Haines and George Walters are working on such a revision and have already found several undescribed species among material collected in Arizona—I’m sure they will be pleased to include these specimens in their study as well. My sincere thanks to Paul Kaufman for faithfully sending to me for examination his “catch” at the end of each season and allowing me to publish information gleaned from the included specimens. Keep it up, Paul! MacRae, T. C., and G. H. Nelson. 2003. Distributional and biological notes on Buprestidae (Coleoptera) in North and Central America and the West Indies, with validation of one species. The Coleopterists Bulletin 57(1):57–70. Nelson, G. H., and T. C. MacRae. 1990. Additional notes on the biology and distribution of Buprestidae (Coleoptera) in North America, III. The Coleopterists Bulletin44(3):349–354. Nelson, G. H., R. L. Westcott and T. C. MacRae. 1996. 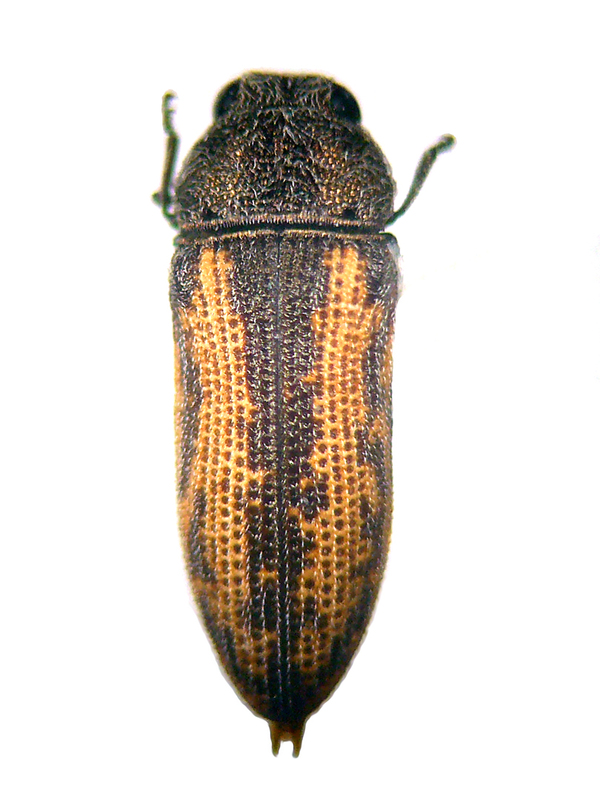 Miscellaneous notes on Buprestidae and Schizopodidae occurring in the United States and Canada, including descriptions of previously unknown sexes of six Agrilus Curtis (Coleoptera). The Coleopterists Bulletin 50(2):183–191. This entry was posted in Buprestidae, Coleoptera and tagged Arizona, beetles, entomology, insects, jewel beetles, nature, science, taxonomy. Bookmark the permalink. My first experience with Anambodera in the field was “What kind of small Acmaeodera flies and lands in the dirt or on rocks, rather than on flowers or other plants”. We found these at three separate locations in northern California in past years. Specimens were sent to Gayle Nelson at the time, and he indicated they may also be an undescribed species. Interesting little guys those Anambodera. That was my reaction the first time I encountered them as well. Fortunately, I was actually with Gayle on my first time out with him, shortly after moving to California from Missouri. At first I thought they were little bees or something flying to burrows in the ground, but when one landed I saw it was a buprestid beetle. I’m sure my question to Gayle when I showed them to him was almost verbatim what you write above.